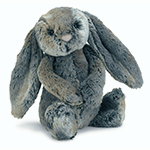 Jellycat Bashful Woodland Bunny is the picture of bunny style, with her fluffy two-tone fur and sweet, friendly smile. Is she grey or orange? Silver or fawn? Who knows, but she’s lolloping out on the lawn! Paired with Jellycats "The Magic Bunny" book (Sold Separately) makes a great Birthday, Baby Shower, or Just Because gift.